A cableway experience, sightseeing and kids’ adventures at Hartebeespoort Dam, Bojanala-Eastern Region. Experience the longest mono-cableway in Africa at Harties Cableway. It’s an opportunity to absorb beautiful 360-degree views of the Magaliesberg from on high. The revamped cableway and beautiful facilities offer an unparalleled experience for families and anyone interested in this fascinating area. Shopping, dining and educational walks are all available at the top of Harties Cableway. There is a Kidzone and a fascinating Dassie Loop walk for kids with lots of interesting facts about the area. 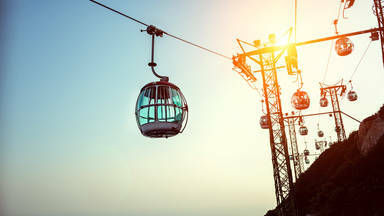 At Harties Cableway, enjoy gliding over this beautiful place, rich in geological and human history. The experience was absolutely breath taking. I would it all over again. ... - Ntombizodwa Maphisa. Book things to do at Harties Cableway. Find the best things to do at Harties Cableway. What people say about Harties Cableway. The experience was absolutely breath taking. I would it all over again. Very nice loved the experience! But would have loved the option to go up the cableway privately and not have to sit with other people.